Cassie Thornton's "debt visualization" method. Last week I had the pleasure of attending the MoneyLab, a two days event focused on interventions and experiments with digital economy and financialization. One of my favorite speech was the one by Cassie Thornton from the Feminist Economics Department, entitled "Financial Literacy". Cassie began her talk by aptly describing the way in which a financial mindset is taught in schools through means of mathematical exercises. Cassie contended that these exercises encourage young students to adjust their desires to the financial means they have. Therefore, already in their early education, they have to face a form of financial realism. Then, Cassie focused on debt, which she considers the medium of her artistic practice. In her work, she looks at how debt is perceived, imagined, and visualized. Cassie asked several people associated with or impacted by debt to describe how they visualize it and whether they consider it real. As she puts it, "it is a way to witness the impact of economics on the unconscious, specifically the experience of holding, witnessing, or fearing predatory corporate debts." 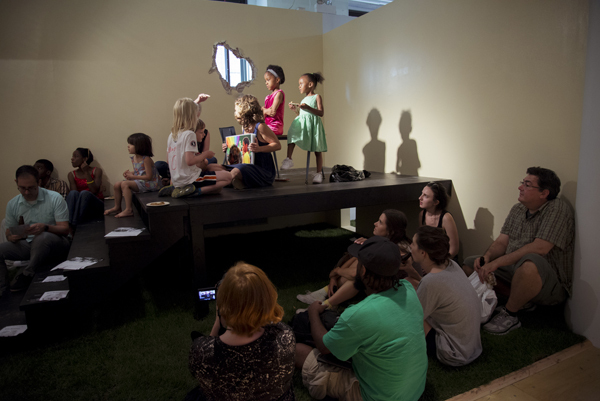 Some of these visualization were later materialized as an interactive installation in which Cassie (who had to deal with her own MFA debt) asked children to imagine ways to "literally break out of the crisis that has so immobilized and sucked dry the adult imagination." In the field of media art, "making things visible" is a common method. This generally means to create art pieces that show the operations of the machine: how big a drone is, how the algorithm works, etc. 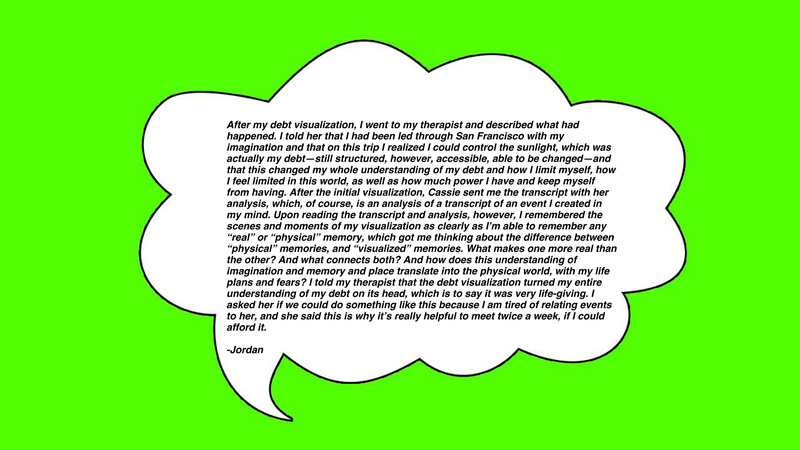 Cassie’s practice is also about making things visible, but in this case the visualized thing is the "lived abstraction" of debt, thus the individual feelings and perceptions that can epitomize broader social facts. Thornton’s visualizations are meant to "collectivize" debt and its effects. Cassie Thornton’s approach made me think of the discussion that followed a recent talk I gave at LustLAB. In this talk, I advocated for social cohesion through the formation of the entreprecariat. The entreprecariat rejects a descriptive and therefore immobilizing understanding of the precariat. On the contrary, it reclaims the ambigous facets of precarity with the aim of constructing an evolving social platform in which the centrality of work can be questioned, the pros and cons of UBI can be discussed, and so on. In order to do this, the entreprecariat fabricates its own "slogans, memes and chants". During the discussion, the issue of scalability was brought to the fore: how can a meme machine propelled by the creative class –in particular the art and design students– can have effects outside of the "self-referential bubble of people who already follow Nick Srnicek on twitter or listen to NovaraMedia’s podcasts every week" (as Sandberg student Floris van Driel puts it)? In the talk, I found myself going a bit off track and speaking of feelings. This might be because feelings, in the sense of both perceptions and emotions, like in Cassie’s work, are the key to the scalability of the entreprecariat. The precariat is currently a professional and economic descriptor strategically employed by news media and negatively internalized by the public ("the precariat is made of people who can’t find a job, maybe because they don’t want to"). Precarious workers are weak, lazy, sometimes disadvantaged and therefore poor. Few people are comfortable with this kind of classification focused on "deserved" and somehow inevitable material conditions. The precariat consists of those who feel their lives and identities are made up of disjointed bits, in which they cannot construct a desirable narrative or build a career, combining forms of work and labour, play and leisure in a sustainable way. The keyword here is "feel". What people feel is real and has dramatically real effects. This is why the creative class needs to reframe precarity primarily as a matter of feelings and perceptions and secondarily as a matter of material conditions. The perception of one’s own life as "bisjointed bit " is the lowest common denominator of the precariat. Clearly, giving more relevance to feelings than to material conditions involves some risks. The precariat, as conceptualized by Guy Standing, includes extremely diverse social groups, with radically different material conditions. Rooting the precariat on feelings and perceptions means conflating the relatively afflicted and relatively poor with the relatively afflicted and absolutely poor. Are we able to imagine a protest led by migrants together with design students? After all, they both inhabit the geography of global migrations. If this sounds like science fiction, we should remember that during the ’60s and ’70s university student felt they were part of the same struggle fought by factory workers (clearly not one without controversies). The risks concerning the adunation of diverse social groups corresponds exactly to the radical aspect of a perceptual, emotional, even visceral precariat. According to An Xiao Mina, "we have what author Claire Light has called a failure of our global imagination". Because of that, people cannot accept mobile phones as a migrant’s basic need. Maybe, the development of a truly global imagination begins from the exchange of ideas among different subjects around the perception of their own conditions. Perhaps we would find out that the need for stability is a genuinely global common. The emotional is political, and as such it must be acknowledged. The sphere of affectivity shoulnd’t be confined to the traditional boundaries of reproductive labor and the ones surrounding the exploitation –often self-exploitation– of passion and enthusiasm. Furthermore, the emotional shouldn’t be limited to its positive spectrum: we must express discomfort. "One laments to find comrades", to paraphrase Breton. Agonize to organize. Hopefully, this attitude would lead to an unconditional form of solidarity, and to a refusal of an idea of class based on the comparison of material deprivation. Understanding people as emotional subjects, instead of economical ones, requires mutual faith. 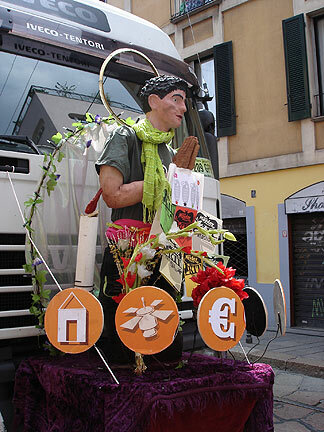 An effigy of San Precario at the EuroMayDay06 parade. Historically, religion and its institutions served the function of a "social glue" that catalyzed feelings and other impulses deemed irrational. Recently, I was glad to stumble upon San Precario in Geert Lovink’s Social Media Abyss, published in 2016. San Precario is an idol emerged in 2004 as a reaction to employment precarity: "Given the strong religious traditions of Catholicism within Italy, San Precario was created as a faux saint, which mimics the many rituals of saint idolisation." Will San Precario resurrect to become the patron saint of the emotional precariat?